Hail damage, drought and high summer temperatures are expected to reduce the 2018 Tru-Cape apple and pear crop by 10 per cent in volume, with smaller fruit sizes also expected to reduce export income. As a result, the company has been negotiating purchase programmes with customers to maximise the value of their growers’ returns to allow them to further invest in crop planting, according to Tru-Cape’s marketing director Conrad Fick. Meanwhile Andre Cloete, a Tru-Cape grower at Klein Ezeljacht Farm in the Overberg, near Greyton, reports that hail had damaged 35 per cent of his crop of red apples while he lost 55 per cent of his Golden Delicious. Cloete explained that they typically have between 1,000ml and 1,200ml of winter rain in the year, but this last year he has had to reduce apple and pear crop irrigation, typically between September and May, by 60 per cent. This means that the trees are only getting 40 per cent of the water they need. It marks the third year of dealing with drier winters, Cloete continued, and due to investment in monitoring and irrigation technologies that includes scheduling, growers are now using neutron probes to accurately measure soil moisture and transpiration. 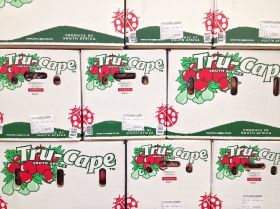 Fick outlined that for Tru-Cape Fruit Marketing the ability to supply apples and pears in volume for 12 months of the year is one of the company’s strategic advantages. “Part of our procurement strategy is to have fruit available from a number of different climatic regions so that when climate impacts fruit from one region we are able to source fruit from another region," he said. This why Tru-Cape has growers in the Elgin, Grabouw, Villiersdorp and Vyeboom Valleys, as well as more than 140km away in Ceres and the Witzenberg areas Valleys and on the edge of the Western Cape, 600km east, in the Langkloof area. Both Fick and Cloete agree that the shelf life or the staying quality of fruit affected by the drought will play a role in reducing income from the current crop.